Knotted Bamboo Skewers are durable so you can use them with confidence, plus, they are hard to make so you can depend on them to stand up well in any kind of food setting. Knotted Bamboo Skewers also have a natural appearance and add a classy touch to appetizers, burgers and a variety of other culinary treats. 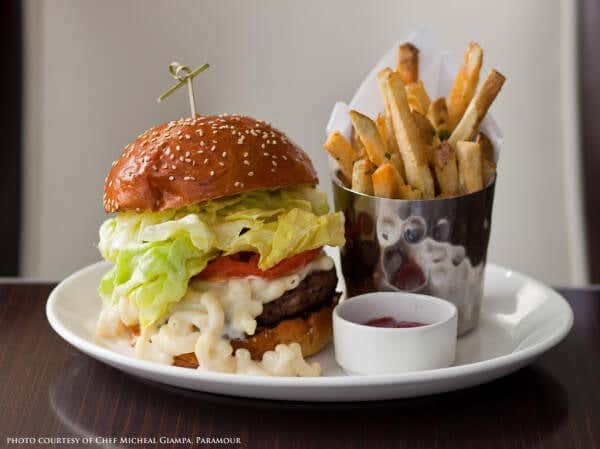 This tasty Macaroni and Cheese Burger is filled with flavor and perfect for catering events, restaurant menus and backyard home party celebrations. After you create this tasty treat, put the finishing touch on it by poking a 4 inch knotted bamboo skewer in the center of it, then serve it up on a charming bamboo plate for all your guests to enjoy. Use charming knotted bamboo skewers for appetizers, burgers and much more. Caramelize your onions in a cast iron skillet, while you wait on the onions place the ground chuck in a large mixing bowl, then divide it into 4 even sections. Now, sprinkle salt over the top of each section. Once onions are cooked, take them out of skillet and set aside. Now, form each burger section into a patty and place each one in your skillet, turn heat to medium high, after about two minutes turn burger patty over and cook the other side, then top the patties with onions and macaroni and cheese. Cook for about 1-3 minutes, until macaroni is heated thoroughly and has a little crispiness on the outside. Take patties out of pan, then place on bun and top with any other condiments that you like. Once burgers are prepared, stick a charming knotted bamboo skewer in the center to help it stay together, serve and enjoy.